CMIRIAMInfo: Stores all MIRIAM info for a Model. Definition at line 38 of file CModelMIRIAMInfo.h. Definition at line 37 of file CModelMIRIAMInfo.cpp. Definition at line 50 of file CModelMIRIAMInfo.cpp. Definition at line 312 of file CModelMIRIAMInfo.cpp. 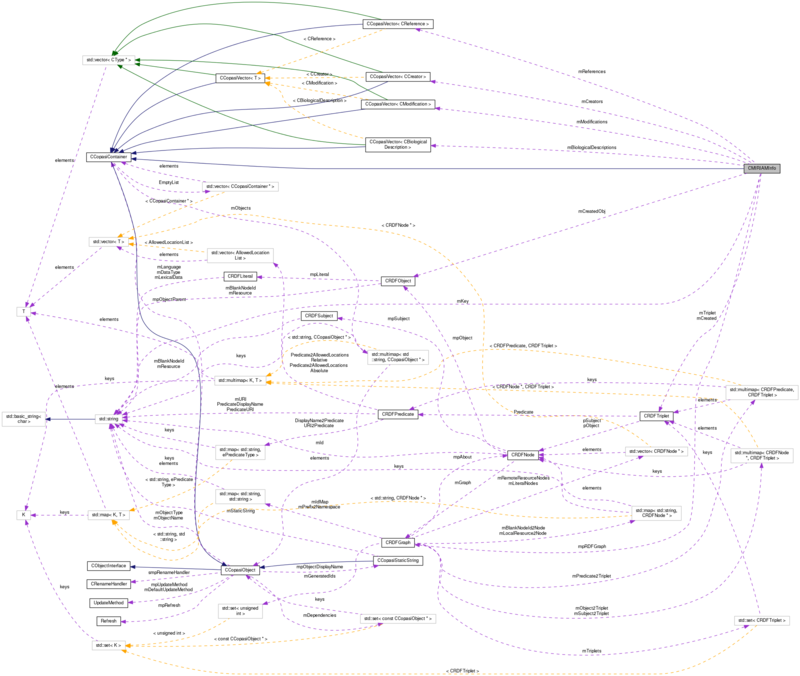 References CCopasiVector< T >::add(), CRDFGraph::addTriplet(), CRDFGraph::getAboutNode(), CRDFNode::getSubject(), mBiologicalDescriptions, mpRDFGraph, CRDFObject::RESOURCE, CRDFObject::setResource(), and CRDFObject::setType(). Definition at line 59 of file CModelMIRIAMInfo.cpp. References CCopasiVector< T >::add(), CRDFGraph::addTriplet(), CRDFObject::BLANK_NODE, CRDFPredicate::dcterms_creator, CRDFGraph::generatedNodeId(), CRDFGraph::getAboutNode(), CRDFNode::getSubject(), CRDFPredicate::getURI(), mCreators, mpRDFGraph, CRDFObject::setBlankNodeId(), and CRDFObject::setType(). Definition at line 248 of file CModelMIRIAMInfo.cpp. References CCopasiVector< T >::add(), CRDFGraph::addTriplet(), CRDFObject::BLANK_NODE, CRDFPredicate::dcterms_modified, CRDFGraph::generatedNodeId(), CRDFGraph::getAboutNode(), CRDFNode::getSubject(), CRDFPredicate::getURI(), mModifications, mpRDFGraph, CRDFObject::setBlankNodeId(), CModification::setDate(), and CRDFObject::setType(). Definition at line 137 of file CModelMIRIAMInfo.cpp. References CCopasiVector< T >::add(), CRDFGraph::addTriplet(), CRDFObject::BLANK_NODE, CRDFPredicate::dcterms_bibliographicCitation, CRDFGraph::generatedNodeId(), CRDFGraph::getAboutNode(), CRDFNode::getSubject(), CRDFPredicate::getURI(), mpRDFGraph, mReferences, CRDFObject::setBlankNodeId(), and CRDFObject::setType(). Definition at line 309 of file CModelMIRIAMInfo.cpp. Referenced by CQBiologicalDescriptionDM::data(), CQBiologicalDescriptionDM::removeRows(), CQBiologicalDescriptionDM::rowCount(), CQBiologicalDescriptionDM::setData(), CQMiriamWidget::slotBtnBrowseDescription(), and CSBMLExporter::updateMIRIAMAnnotation(). Definition at line 212 of file CModelMIRIAMInfo.cpp. References CRDFPredicate::dcterms_W3CDTF, CRDFNode::getFieldValue(), mCreated, and CRDFTriplet::pObject. Referenced by CQMiriamWidget::showEvent(), CQMiriamWidget::slotCreatedDTChanged(), CQMiriamWidget::update(), and CSBMLExporter::updateMIRIAMAnnotation(). Definition at line 56 of file CModelMIRIAMInfo.cpp. Referenced by CQCreatorDM::data(), CQCreatorDM::removeRows(), CQCreatorDM::rowCount(), CQCreatorDM::setData(), and CSBMLExporter::updateMIRIAMAnnotation(). Definition at line 475 of file CModelMIRIAMInfo.cpp. Definition at line 245 of file CModelMIRIAMInfo.cpp. Referenced by CQModifiedDM::data(), CQModifiedDM::removeRows(), CQModifiedDM::rowCount(), CQModifiedDM::setData(), and CSBMLExporter::updateMIRIAMAnnotation(). Definition at line 53 of file CModelMIRIAMInfo.cpp. Definition at line 134 of file CModelMIRIAMInfo.cpp. Referenced by CQReferenceDM::data(), CQReferenceDM::removeRows(), CQReferenceDM::rowCount(), CQReferenceDM::setData(), CQMiriamWidget::slotBtnBrowseReference(), and CSBMLExporter::updateMIRIAMAnnotation(). Definition at line 399 of file CModelMIRIAMInfo.cpp. References CAnnotation::castObject(), CRDFGraph::createAboutNode(), CRDFPredicate::dcterms_created, CKeyFactory::get(), CRDFNode::getDescendantsWithPredicate(), CCopasiObject::getKey(), CCopasiRootContainer::getKeyFactory(), CAnnotation::getMiriamAnnotation(), CRDFNode::getPath(), CRDFParser::graphFromXml(), loadBiologicalDescriptions(), loadCreators(), loadModifications(), loadReferences(), mCreated, mKey, mpRDFGraph, mTriplet, pdelete, and CRDFTriplet::pObject. Referenced by CQMiriamWidget::showEvent(), test000092::test_miriam_export_8(), test000092::test_miriam_export_9(), test000092::test_miriam_import_1(), CQMiriamWidget::update(), and CSBMLExporter::updateMIRIAMAnnotation(). Definition at line 353 of file CModelMIRIAMInfo.cpp. References CCopasiVector< T >::add(), CRDFPredicate::bqbiol_encodes, CRDFPredicate::bqbiol_hasPart, CRDFPredicate::bqbiol_hasVersion, CRDFPredicate::bqbiol_is, CRDFPredicate::bqbiol_isEncodedBy, CRDFPredicate::bqbiol_isHomologTo, CRDFPredicate::bqbiol_isPartOf, CRDFPredicate::bqbiol_isVersionOf, CRDFPredicate::bqbiol_occursIn, CRDFPredicate::bqmodel_is, CCopasiVector< T >::cleanup(), CRDFPredicate::copasi_encodes, CRDFPredicate::copasi_hasPart, CRDFPredicate::copasi_hasVersion, CRDFPredicate::copasi_is, CRDFPredicate::copasi_isEncodedBy, CRDFPredicate::copasi_isHomologTo, CRDFPredicate::copasi_isPartOf, CRDFPredicate::copasi_isVersionOf, CRDFPredicate::copasi_occursIn, CRDFPredicate::end, CRDFNode::getDescendantsWithPredicate(), CRDFNode::getPath(), mBiologicalDescriptions, mTriplet, and CRDFTriplet::pObject. Definition at line 102 of file CModelMIRIAMInfo.cpp. References CCopasiVector< T >::add(), CCopasiVector< T >::cleanup(), CRDFPredicate::dc_creator, CRDFPredicate::dcterms_creator, CRDFPredicate::end, CRDFNode::getDescendantsWithPredicate(), CRDFNode::getPath(), mCreators, mTriplet, and CRDFTriplet::pObject. Definition at line 294 of file CModelMIRIAMInfo.cpp. References CCopasiVector< T >::add(), CCopasiVector< T >::cleanup(), CRDFPredicate::dcterms_modified, CRDFNode::getDescendantsWithPredicate(), mModifications, mTriplet, and CRDFTriplet::pObject. Definition at line 180 of file CModelMIRIAMInfo.cpp. References CCopasiVector< T >::add(), CRDFPredicate::bqbiol_isDescribedBy, CRDFPredicate::bqmodel_isDescribedBy, CCopasiVector< T >::cleanup(), CRDFPredicate::dcterms_bibliographicCitation, CRDFPredicate::end, CRDFNode::getDescendantsWithPredicate(), CRDFNode::getPath(), mReferences, mTriplet, and CRDFTriplet::pObject. Definition at line 336 of file CModelMIRIAMInfo.cpp. References CBiologicalDescription::getTriplet(), mBiologicalDescriptions, mpRDFGraph, CRDFTriplet::pObject, CRDFTriplet::Predicate, CRDFTriplet::pSubject, CCopasiVector< T >::remove(), and CRDFGraph::removeTriplet(). Definition at line 86 of file CModelMIRIAMInfo.cpp. References CCreator::getTriplet(), CRDFPredicate::getURI(), mCreators, mpRDFGraph, CRDFTriplet::pObject, CRDFTriplet::Predicate, CRDFTriplet::pSubject, CCopasiVector< T >::remove(), and CRDFGraph::removeTriplet(). Definition at line 278 of file CModelMIRIAMInfo.cpp. References CModification::getTriplet(), CRDFPredicate::getURI(), mModifications, mpRDFGraph, CRDFTriplet::pObject, CRDFTriplet::Predicate, CRDFTriplet::pSubject, CCopasiVector< T >::remove(), and CRDFGraph::removeTriplet(). Definition at line 164 of file CModelMIRIAMInfo.cpp. References CReference::getTriplet(), CRDFPredicate::getURI(), mpRDFGraph, mReferences, CRDFTriplet::pObject, CRDFTriplet::Predicate, CRDFTriplet::pSubject, CCopasiVector< T >::remove(), and CRDFGraph::removeTriplet(). Definition at line 449 of file CModelMIRIAMInfo.cpp. References CAnnotation::castObject(), CRDFGraph::clean(), CKeyFactory::get(), CAnnotation::getKey(), CCopasiRootContainer::getKeyFactory(), mKey, mpRDFGraph, CAnnotation::setMiriamAnnotation(), CRDFGraph::updateNamespaces(), and CRDFWriter::xmlFromGraph(). Definition at line 220 of file CModelMIRIAMInfo.cpp. References CRDFGraph::addTriplet(), CRDFObject::BLANK_NODE, CRDFPredicate::dcterms_created, CRDFPredicate::dcterms_W3CDTF, CRDFGraph::generatedNodeId(), CRDFNode::getPath(), CRDFNode::getSubject(), CRDFPredicate::getURI(), mCreated, mpRDFGraph, mTriplet, CRDFTriplet::pObject, CRDFObject::setBlankNodeId(), CRDFNode::setFieldValue(), and CRDFObject::setType(). Definition at line 46 of file CModelMIRIAMInfo.h. Referenced by createBiologicalDescription(), getBiologicalDescriptions(), loadBiologicalDescriptions(), and removeBiologicalDescription(). Definition at line 50 of file CModelMIRIAMInfo.h. Referenced by getCreatedDT(), load(), and setCreatedDT(). Definition at line 47 of file CModelMIRIAMInfo.h. Definition at line 43 of file CModelMIRIAMInfo.h. Referenced by createCreator(), getCreators(), loadCreators(), and removeCreator(). Definition at line 42 of file CModelMIRIAMInfo.h. Referenced by getKey(), load(), and save(). Definition at line 45 of file CModelMIRIAMInfo.h. Referenced by createModification(), getModifications(), loadModifications(), and removeModification(). Definition at line 48 of file CModelMIRIAMInfo.h. Referenced by createBiologicalDescription(), createCreator(), createModification(), createReference(), getRDFGraph(), load(), removeBiologicalDescription(), removeCreator(), removeModification(), removeReference(), save(), setCreatedDT(), and ~CMIRIAMInfo(). Definition at line 44 of file CModelMIRIAMInfo.h. Referenced by createReference(), getReferences(), loadReferences(), and removeReference(). Definition at line 49 of file CModelMIRIAMInfo.h. Referenced by load(), loadBiologicalDescriptions(), loadCreators(), loadModifications(), loadReferences(), and setCreatedDT().